Conscious Birthing was founded by Kate Woods over 20 years ago and has grown from a small Doula practice to an International Doula School, offering everything from Doula service to Doula training, ongoing Student Guidance Programes, Holistic Prenatal Classes, and one-to-one sessions and workshops. Kate has been involved with the process of pregnancy and birth since 1994, when she had her first child. The experience was so immense and utterly life changing for her that through it, her passion for this magical phase of life and all its potential for the future was initiated. Shortly after Kate's first birth, friends (and then friends of friends) began to request her presence at their labours, and by the time she trained as a Doula herself in 1998 with Michel Odent, she had already attended many births within her community. In the years since, Kate began her 'In Good Hands' Doula practice, which has grown from a 'newborn' to a large and busy family, still growing and evolving today. Kate continues to work closely with pregnant and birthing women and their families, whilst facilitating holistic pregancy and childbirth workshops and retreats, speak at conferences, support new Doulas and oversee our unique Student Guidance Programme. Kate's continuous studies have been with Michel Odent, Robbie Davis-Flloyd, Elizabeth Davis, Angelina Martinez, Ina May Gaskin, the Holistic Childbirth Educator Foundation, Janet Balaskas at the Active Birth Centre and Suzanne Yates at Well Mother (Shiatsu for Labour). She has also taken much guidance and learning from traditional midwives around the world, on her travels. Kate is a registered member of UK, a Doula Guide/Mentor, an associate of the European Doula Network and a Holistic Childbirth Educator. Kate also facilitates the growing network of Conscious Birthing Doulas, our International Doula School, providing training and ongoing guidance programmes. For Kate, pregnancy and birth is a truly bountiful time, which deserves to be reclaimed as the powerful rite of passage which it has always been: learning, honouring and celebrating this with others is her passion and her life’s work. Encouraging all back into their inherent power remains as Kate's greatest focus. 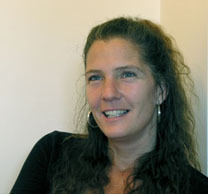 Kate has two grown children and lives in Glastonbury, Somerset, working as a Doula in many neighbouring areas as well as further afield. To contact Kate about Doula and postnatal services, please contact us.